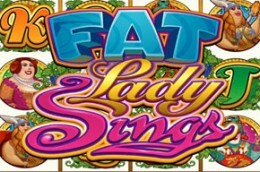 The Fat Lady Sings is an video slot with an opera theme and related graphics and symbols. The game is a 5 reels and 25 paylines video slot powered by Microgaming. The main characters of this game are 3 fat ladies who are the singing divas of the opera. The main symbols are 3 fat ladies and these are: the Viking Fat Lady, the Asian Fat Lady and the Fat Lady. The lower value symbols are represented by the standard playing cards (J, Q, K and A). The wild symbol is the Fat Lady Sings logo and the Masks symbol is the scatter symbol.